Al Capone Slims originate from Honduras and feature a natural Colorado Claro wrapper. These petite cigarillos are hand rolled and rum dipped for a sweet taste and tantalizing aroma. The Al Capone cigars are reasonably priced and are perfect for individuals that enjoy a quick, tasty smoke. I like the tiny cigar. I thought I ordered "filtered" but it wasn't. Other than having to spit out pieces of tobacco periodically it smokes well and tastes good. They are pricey though. But I still save when ordering online versus in the store. do not smoke cigarettes. But I do enjoy this cigar in the evening at days end. 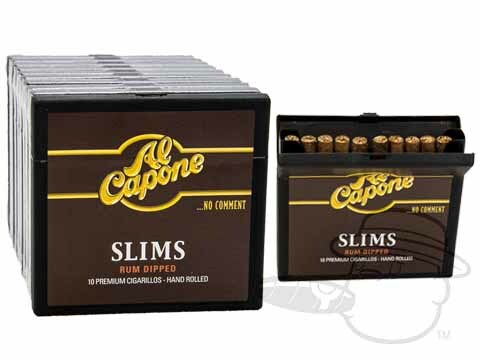 Al Capone Rum-Dipped Slims is rated 4.5 out of 5 based on 12 customer ratings.